Make heads turn with this classic piece of a jumpsuit and own the night! Accessorize with: Pin your hair to one side add a statement ear cuff to the exposed ear a pair of high heels and your brightest shade of red lipstick to complete the ensemble and make some heads turn! 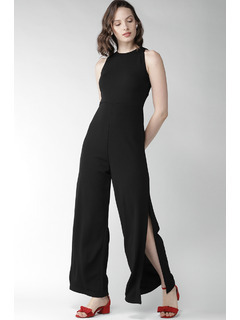 Black full length jumpsuit with elastic waist. Lace inserts in the front and back yoke. Buttons at centre back for ease and fastening. Note: Accessories shown with the product are only for styling purposes..